Today, when you order "Jeff Hobson Live! ", you'll instantly be emailed a Penguin Magic gift certificate. You can spend it on anything you like at Penguin, just like cash. Just complete your order as normal, and within seconds you'll get an email with your gift certificate. Jeff Hobson Live! (DVD) Watch and learn Jeff Hobson's HILARIOUS Vegas headlining act! Comedy magician extraordinaire, Jeff Hobson has done it all! From headlining in Las Vegas to feature performances on network television (NBC's World's Greatest Magic) and cable networks such as Showtime. He's a sought after performer for Fortune 500 corporate events, trade shows, and motivational speaking. 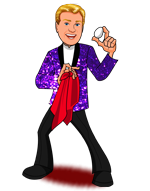 Jeff Hobson in known worldwide as one of the funniest and busiest comedy and magic performers on the planet! Here is your chance to see him strut his stuff! Jeff Hobson has to be one of the funniest performers I have ever seen. This video does teach a few effects, but it does NOT teach the whole act that you'll see performed on the DVD. However, you will learn a TON more from watching him perform than you ever will from watching the "teaching" section. This DVD is a Live performance of Jeff Performing his incredible act. Totally hilarious and entertaining. You definitely want more when it's over. On top of this, he teaches you his handling for Silk to Apple, Balloon Bag and a few other things. Balloon Bag has to be my favorite routine. A complete routine with just a paper bag and a few balloons. Talk about packing flat and playing Enormous! If you're looking to be entertained by an incredible performer, get this DVD. If you're looking to learn by watching a pro in action, get this DVD. If want to learn a few killer tricks to add to your act, get this DVD. Total GEM and a must have for anyone who's even a tiny bit serious about magic. The MSRP is $34.95 which is a heck of a lot cheaper than buying a ticket for his show. Get it. GEM! This is a great DVD from a seasoned professional. Just presentation is humorous and entertaining. You'll totally get some great ideas for your performance from this DVD. Comedy magic at its finest. Hobson is a legend. This DVD will give you a pile of comedy material that you can put to good use in several settings. The egg bag routine is one of my favorite and I think I would be lost without it in many instances. If you want a quality DVD and some really good material this is the one to get. Hobson will have you holding your side during the performance portion. This a fantastic DVD if you want to watch someone in action who really knows what he is doing and if you want to learn what a well developed "Character" looks like. If you are buying the DVD to "rip off" the character he plays and try to be Jeff Hobson this is not the one for you. Hobson is a real packs small plays big kinda guy. If you want a lesson in entertainment and some easy to perform tricks that are well tested then buy this DVD. The best is the performance of the Hobson egg bag if you have it this there is a great performance of it. The Balloon Bag trick is also worth the price of the entire DVD. I have it. It is the one of the best DVD's I have. It was fun and entertaining to watch and the explanations were amazing and so easy to understand! I love his original comical style! I wish I had bought this sooner! This is the best way to improve our act to be much more entertaining. Buy it! Learn the right way. I was looking for some funny lines and tricks to add some spice to my show, but this one just doesn't cut it.